pNet - pManifold Network Blog: Rural Franchisees - Could they become pilot ground to raise next level of Distribution services? Rural Franchisees - Could they become pilot ground to raise next level of Distribution services? Rs. 26000 cr. already spent in last 6 years since 2005 and estimated another same amount to be spent (totaling to Rs. 52000 cr.) for coverage of RGGVY original targets of 100% village electrification and 2.34 cr. rural BPL household connections. By estimate of investment, of order Rs. 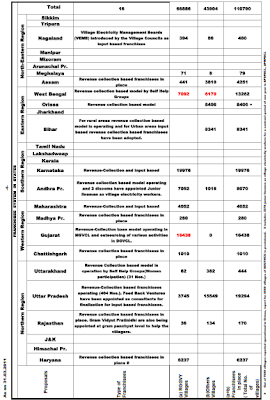 52000 cr., RGGVY scheme is comparable to R-APDRP scheme of GoI. A simple comparison of the 'existing' market size (both in terms of numbers and contract values) of Distribution Franchisee opportunities between Rural and Urban, seems to point Rural as a winner. 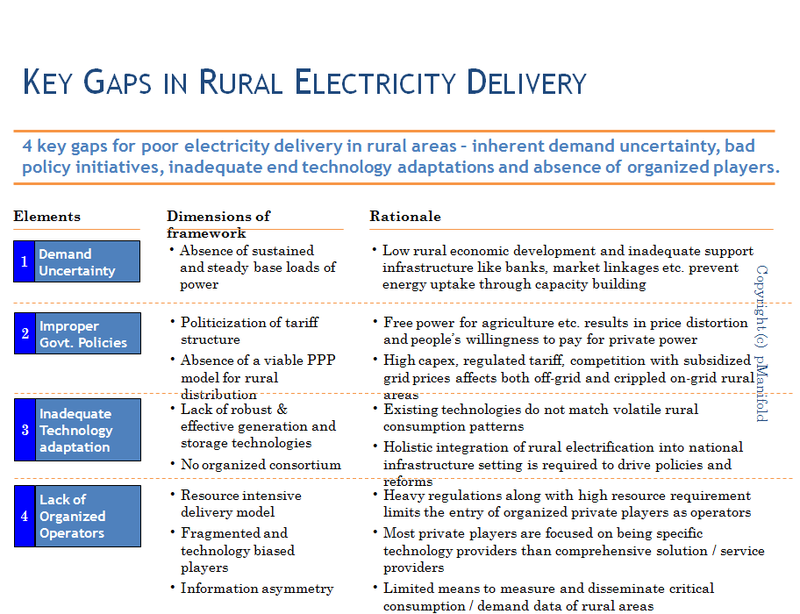 However challenges remains with some key gaps identified below in delivering rural electricity. Question is what could be learnt from solving these 'rural' specific challenge with so much investment already gone into it and still more to come? What will be the applicability of those learning to broader Power Distribution markets? Could that lead to 'disruptive innovation' for improving financial health of utilities in India and improve Distribution efficiencies? Who amongst private players will bring that 'market inflection'? Will the teachings of late Prof. C.K. Prahalad on 'Fortune at the bottom of pyramid' be applicable to this sector and who will set the first path? There are already great efforts from many new players to enter into upcoming Distribution Franchisee bids (at district level like as in Madhya Pradesh) and they face tough competition against tough terms and conditions (like high 'reserve rates', strong qualification criterion, high EMD & security deposits etc.). It is possible that these new entrants or even established private companies also consider building first hand experience from participating in lower capital risk Rural Franchisees and bring their private corporate management best practices to establish reforms and innovations. 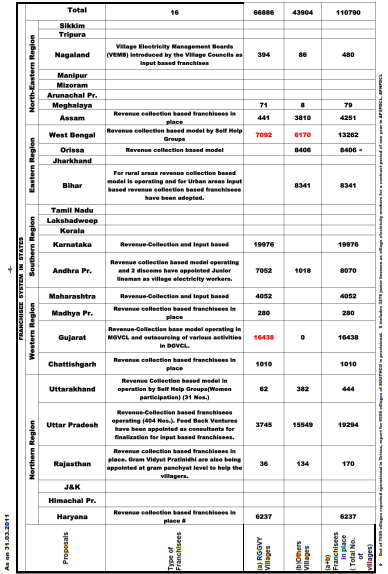 With 1.1 lakhs rural franchisees and that covering only 19% of total villages and already invested Rs. 26000 crores, this could provide an easy and fastest entry to build most direct experience in the sector and participate in bigger bids more strongly, with more experience and hopefully at lowest rates with best workable technology. Not to say that the Rural Franchisee experience would be easier than any urban franchisee or to be treated with less care. Infacts as highlighed above, the odds are higher in rural region and demands innovation. But the one who can cracks this rural challenge of power distribution will definitely emerge as a leader in this space with direct mapping of his skills set to urban challenge, but not the vice-versa for its otherwise competitors. 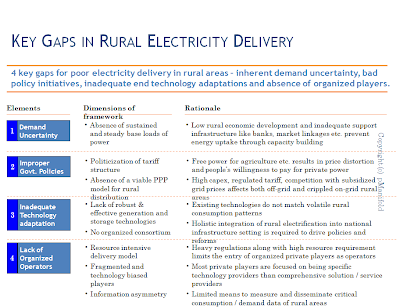 Recent upsurge of 'mobile' market and 'financial inclusion' in rural are clear examples, that even in POWER sector, its time to offer more 'choices' to the end-customers and specially 'Rural consumers' be looked upon as profitable and respected segment (See earlier blog - Why Customer's Satisfaction & Preferences are important for Electricity Utilities?). A shift from Rural-to-Urban-to-Rural will soon begin - See earlier blog Power Distribution Franchisee - Evolution from Rural to Urban and back to Rural.